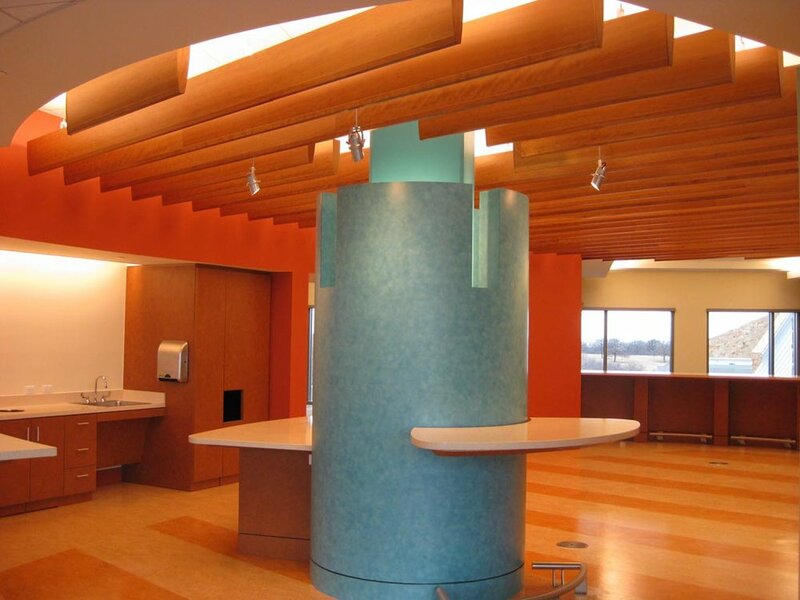 Pre-engineered, pre-finished curved wood ceiling that easily suspends from a Unistrut® framing system. ACGI Allegro™ System provides a pre-engineered, pre-finished curved wood ceiling that easily suspends from a Unistrut® framing system. They are available in concave, convex or serpentine surfaces to meet both the acoustic and aesthetic requirements of the project. Panels suspend with a simple hanger system that provides security and accessibility. The panels are typically grouped together to form ceiling clouds. Allegro™ panels can also attach to walls. Allegro™ Series 1 [AL1] has a "3⁄4" thick core, is factory assembled with shaping and supports ribs, and does not have perimeter trim. NRC of 0.10 (panels only). 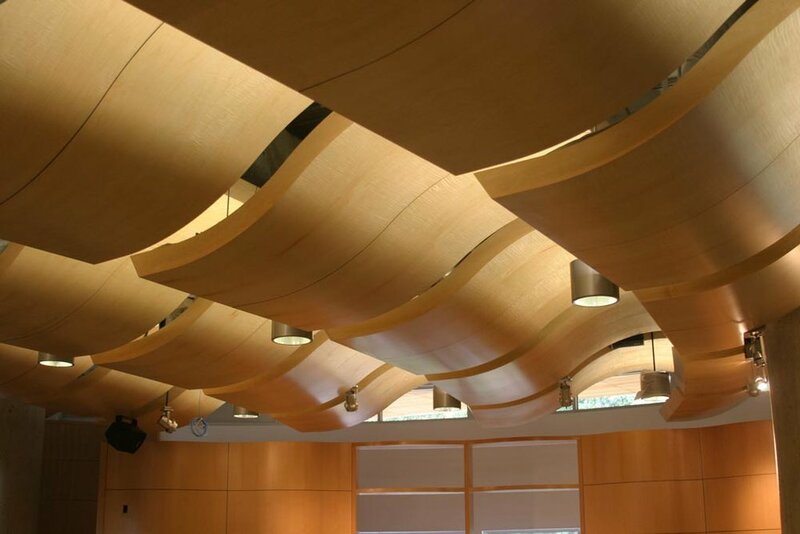 Allegro™ panels are usually large format panels that are factory curved to match architectural and acoustician designs to direct sound within large spaces. The panels are available with natural wood veneer, reconstituted wood veneer, high pressure laminate, or factory painted faces. As these panels are designed to reflect, rather than absorb sound, the faces are non-perforated. 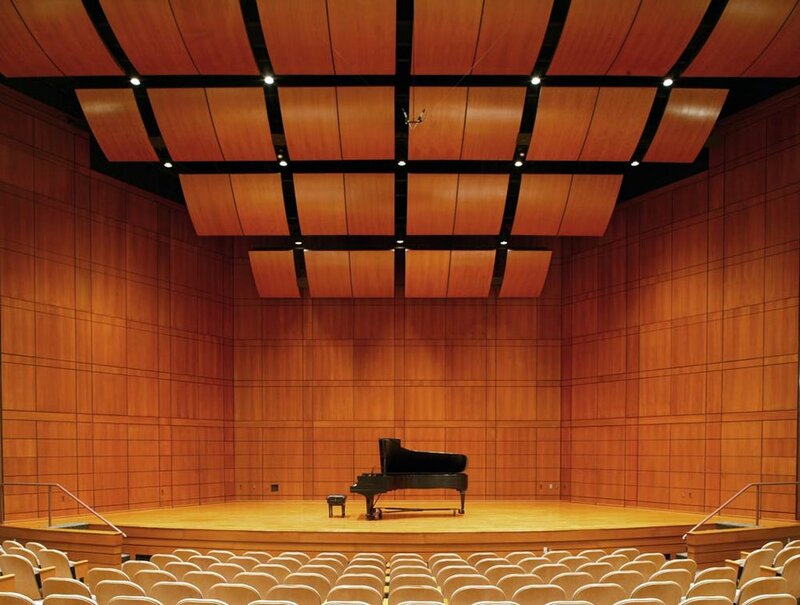 By applying acoustical absorbing material on the backs of panels to absorb non-directed sound within the plenum, the overall acoustical performance of the room is enhanced. Panels are factory curved to convex, concave and serpentine shapes with a minimum of a six inch radius. Depending on the panel curvature, size, location and space between panels, the acoustic characteristics are effectively controlled. The Allegro™ system, coupled with ACGI suspension hangers, is beneficial in auditoriums, theaters, performance halls, and lecture rooms and can be used on either walls or ceilings. Allegro™ panels are available in a large variety of wood veneers to meet design requirements. Allegro™ panels can be finished in any of our standard finish options or custom finishes. Solid wood Finishes and veneer cores can be provided with a Class A Fire rating [ASTM-E84]. exceed 86°F). All windows, doors and wet-work must be complete before installation. Handle carefully to avoid damaging. year all work from Final acceptance of completed work. with shaping and supporting ribs, and includes factory-attached perimeter trim. acoustical requirements. The panel thickness can be increased, and the weight can be increased in upwards to 9 lbs/sq. ft. AL3 is a composite panel with a typical panel thickness of 4 1⁄2". The panel can be filled with acoustical material or the panel can be designed with multiple layers of materials to increase its mass. Wood members mounted to notched wood backers. ACGI Baffle Systems consist of wood members with a depth greater than 31⁄2" and mounted to notched wood backers. Wood members can be made from solid wood or wood veneer over either MDF, particle board, or fire-rated foam. Baffle panels suspend with HD T-Grid or attach to walls with screws through the backer. 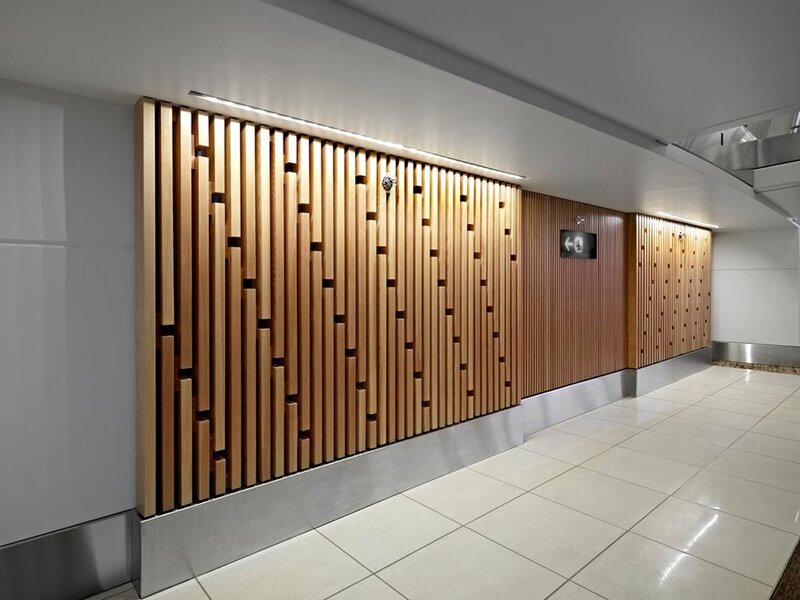 Various wood member thicknesses and spacing can be specified to meet project requirements while the size and the number of baffles can vary depending on design criteria. In addition to our two standard profiles, custom profiles can be manufactured to a specific design. Baffle Series 1 [WB1] have four square sides. Baffle Series 2 [WB2] baffles have a radiused bottom face. Baffle Series 3 [WB3] has radiused blades. Baffle Series 4 [WB4] has radiused backer strips. Acoustical infill can be placed behind the baffle system to achieve any NRC desired. 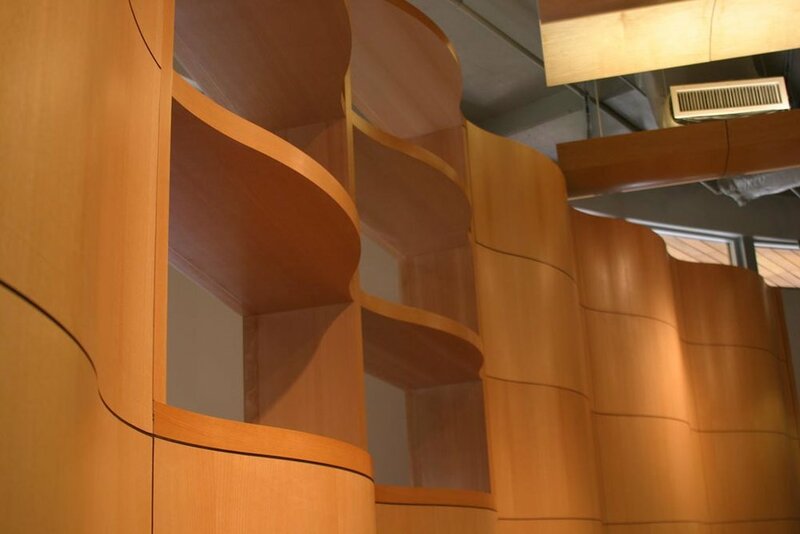 For this product ACGI can source any commercially available solid wood, veneer or thermally-fused laminate and apply any standard, color-matched or custom finish. Contact us for details.